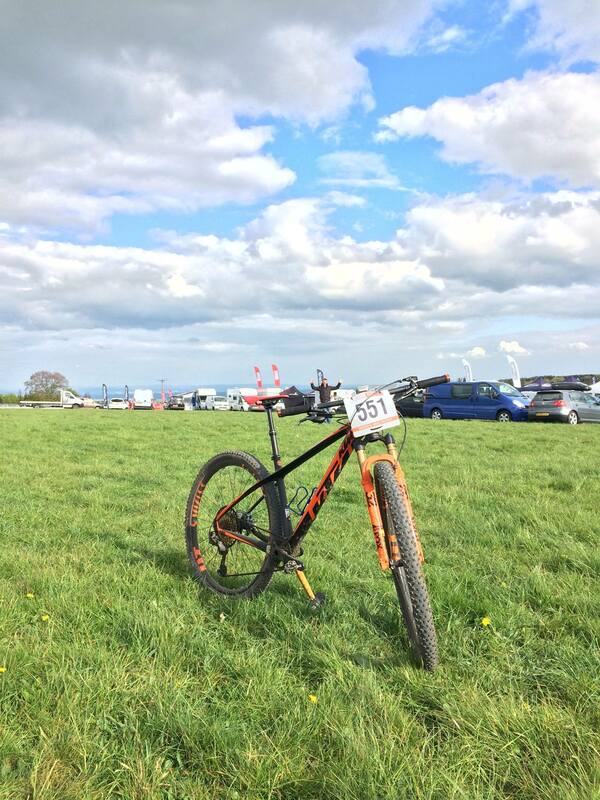 National MTB xc round 3....the return to Aske and the slow climb toward the top. The journey to North Yorkshire is almost starting to become second nature now,having made the 8hr round trip from Norfolk less than two weeks ago for the NE Regional Champs. The course for the Nationals was,for all intents and purposes, identical to the one we faced then. The multiple long, steep climbs were still there, as were the rock strewn single tracks and dusty, steep descents. Almost every meter of this course presented a challenge in some way.....not overly technical but demanding full attention and effort at all times. It hadn't rained there since the last race. It was bone dry then and even a spell of overnight rain had virtually no effect on the course, the water soaking straight into the welcoming soil. The overall leader of the series so far hadn't entered this one and I was called up first to the start line. With 5 or 6 riders in contention for a podium finish ( Tim Davies, ex National champ and Owen Pattinson, winner of rd 1 among them) this was not going to be an easy race by any means but for once I secretly harboured dreams of a possible win. Getting to the first area of tricky technical single track in the lead was going to be key. With no real place to pass, a crash or mishap here would hold up any riders behind. A great battle with Tim saw me exit the woods and onto the more open 'back straight' in first place but Tim soon raced past, keen to extend our advantage over the others, and I slotted in behind him. Matching his pace, pushing strongly up the climbs I felt comfortable and settled in behind, letting Tim do the work as we approached the last wooded area before we started the next lap. The smallest things can make all the difference in racing as I was about to find out. The stump of a small sapling, cut down to make way for the trail through the trees, was poking out of the soil by only a few inches, but far enough for me to clip it with my pedal as I followed Tim through the trees. Instead of seeing his back wheel I was now seeing a spinning mix of dirt, trees, sky, bike, dirt, as I came to an ungainly stop on my back across the trail. A quick check to make sure everything on the bike, and me, was pointing in the right direction and I was off again. Tim was away and I was joined by Owen as we completed Lap 1. Tim had gained a good 20 seconds, not ideal but with another hour to go not impossible to make up either. Decisively though, as the long technical section approached, Tim had got in front of a large group of slower Vet riders and I was stuck behind for the next couple of minutes. Tim was now out of sight and gained another 30 seconds on that lap alone. 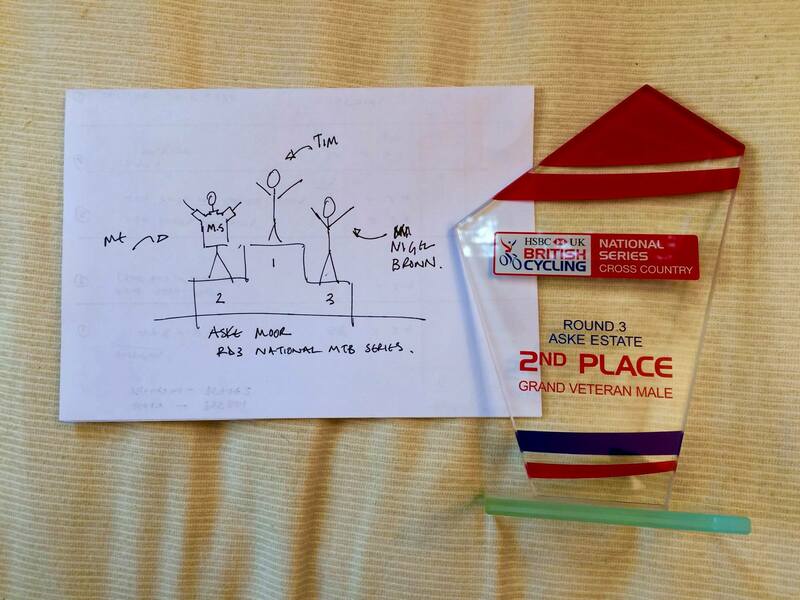 I pushed on hard, pulling out a minute gap on Owen in 3rd and racing with only the slower Vet riders for company. Taking it steady and safe on the final lap I came in over a minute behind Tim, but still had my best placing so far at a National MTB event. There's no disgrace losing to a former national champ I guess but I can't help wondering what might have been. Next time....next time. Thanks as always to the sponsors for helping me race this year....Mike from Sunshine Solar, Carl from Foster Knight Accountants and Mark from Beeston Brewery. Thanks also to Darren @1EpicOrange for supplying the special MS Society jersey and the KTM Myroon Sonic which has been brilliant despite my best efforts to hold it back ! Action photo credit to Alan Draffan Photosport. Check out his superb quality shots on his FB site. 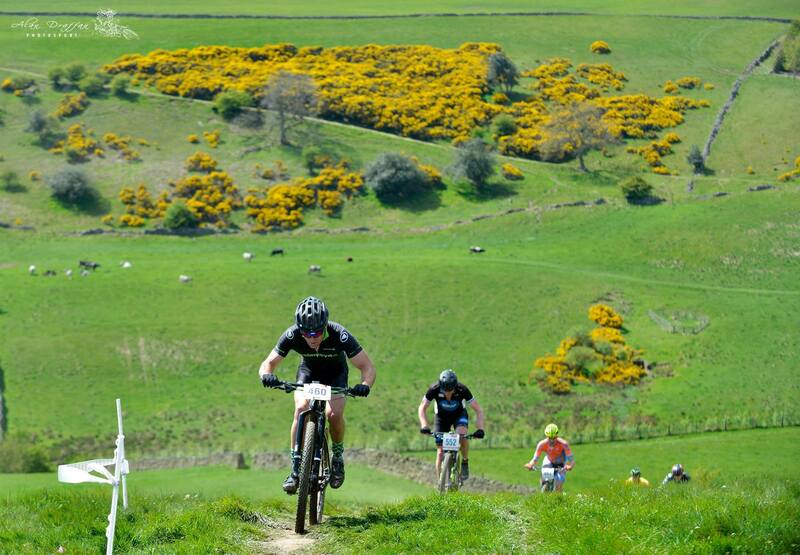 Round 4 is again in Yorkshire, this time at Dalby Forrest in 4 weeks time. Bring it on.